A stylish lobby area, clean, economical rooms and breakfast buffet can be expected at Motel One Berlin-Bellevue. The lounge area and bar are open 24 hours. The motel is located near the Bellevue train station. Guests can easily travel to any attraction in Berlin from here. In summer, the Bellevue area is particularly beautiful. The Presidential Palace is only 2 minutes away by foot and guests may walk along the river Spree or go for a jog in the Tiergarten. The hotel offers free WIFI with purchase of breakfast buffet. This hotel was built recently and has lovely grey and aqua dÃÂ©cor with wooden flooring. The rooms are very stylish with light blue tones. Double or queen-sized beds may be requested, and rooms have a plasma television, bathroom with spacious shower and stylish black tiles. Courtyard or street view rooms are offered to accommodate guests. 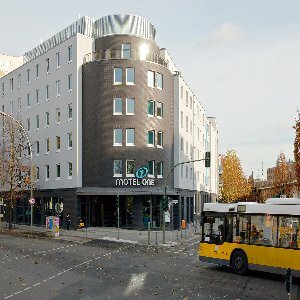 Nice hotel near the central train station (a 15 minutes walk), the Brandenburg Gate and the Reichstag (20 minutes to these venues). In the vicinity of the hotel, there is a decent and charming Cambodian restaurant named Angkor Wat at Paulstrasse 22, virtually next door.The area of Bellevue is well-known for its peaceful and quiet nature. The motel is in a quiet, residential area and good value for guests looking for a calming venue.